Pair Books with Play: Pete’s a Pizza and Lemon Herb Play Dough! I have to say that my husband’s homemade pizza is the best! It inspired us to read the book, Pete’s a Pizza. Have you read this book? It is a favorite of mine. The book is about a little boy named, Pete, who is sad that he can’t go outside to play because it’s raining. As a way to cheer him up, his parents decide to turn him into a pizza! They knead the dough by rolling his body back and forth. They add pretend items to their “pizza” like drips of water for oil, paper shavings for cheese, and checkers for pepperoni. Right as they finish the pizza and Pete starts to feel better, he looks outside and sees that the rain has stopped – he can finally go outside! I really love this book because it touches on the power of a playful parent. I didn’t have the book on hand, but the book, The Little Red Hen (Makes a Pizza) , is also a great book about making pizza! Lil and I dabbled in our own play when we opened a pizza shop. It paired perfectly with the book, Pete’s a Pizza, and we got to use our new, lemon herb play dough! 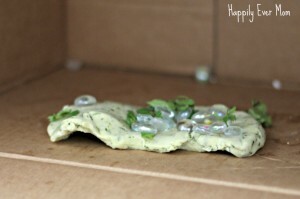 If you didn’t see the post about the play dough we made, you can read more about it here. 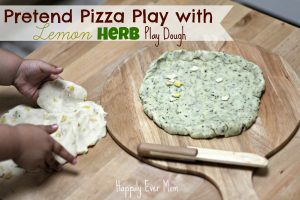 The great thing about having real herbs in our play dough is that we were able to use extra chopped herbs as pizza toppings. As more herbs mixed into the dough, it didn’t matter! 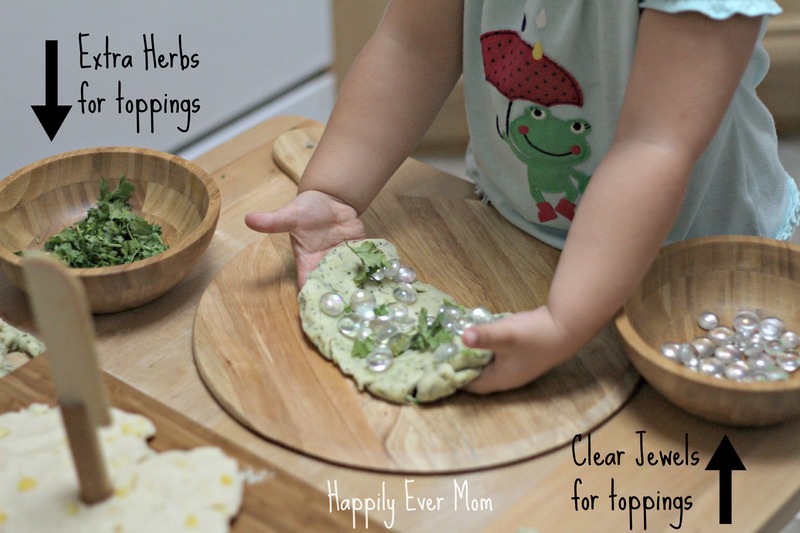 I also put our some of our clear jewels out for extra toppings. Lil used these for onions and mushrooms. **Please note: these jewels could be a choking hazard. Use your judgement with your children as to what materials you choose and always heavily supervise this type of play. Play hard, but stay safe! Then, we put the pizzas into our “oven” which was just a large cardboard box. 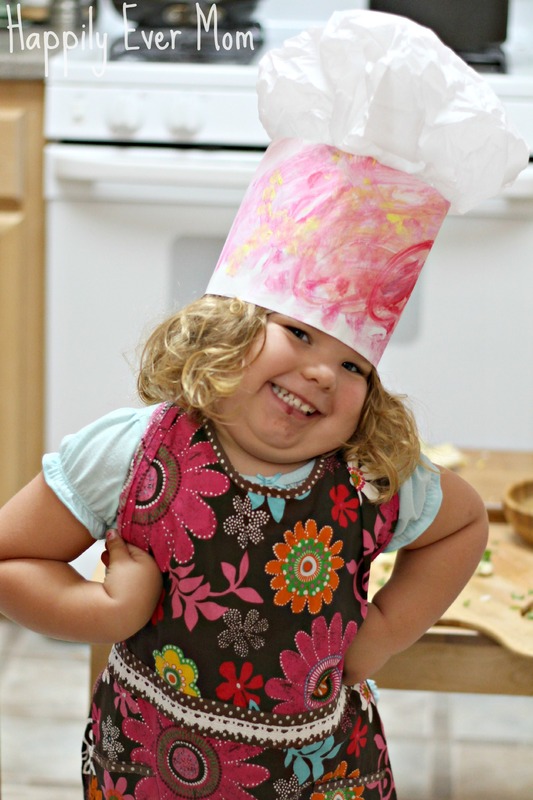 Lil was very responsible as the head chef. She often checked on the pizzas in the oven to make sure that they hadn’t burned and she cut each pizza to order for her “customers.” She even named her restaurant, “Roasties.” Similar to our local pizza place called, “Rusty’s.” 🙂 She had a BLAST with this play. Unfortunately, my photographs really stop here as I got engrossed in the play. Again, you can see a little more on instagram. Lil’s brother wanted to be a part of the action which meant that I only had one hand free! But, we brought out stuffed animals to serve and made pizzas in different pumpkin shapes with faces. We also made a quick and easy chef’s hat and she put on one of my aprons to really look the part of head chef! Honestly, this was such a fun and engaging time together. For me, I think about how quickly my kids are growing up and I am so thrilled when I get to spend such special, engaged time with my kids! What type of play do your kids love?